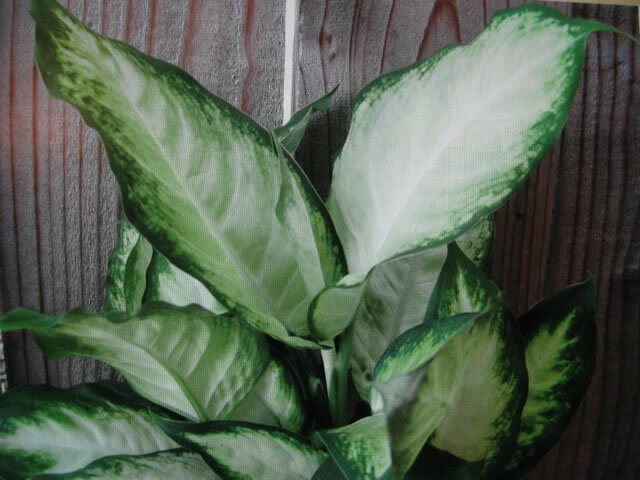 "I have a 8 ft. Dieffenbachia that has gotten too tall for my Kitchen. It has never been cut back and has gotten very tall and bare with only new leaves coming out the top witch is hitting my ceiling. My question is........... How and where do I cut this big main stalk back to make it bush out more ?? I have had this plant for a long time and would hate to make a mistake in doing this major surgery and lose her. Thank you ......."
Keep in mind that when you are doing any type of plant propagation that cleanliness is extremely important. Always use a clean sharp knife and sterile potting soil for the best results! 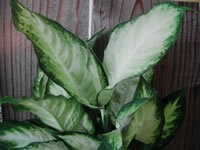 The best method of propagating Dieffenbachias is a process known as air layering. just below a stem ring or node where you would like to cut the plant. Make your cut well through the outer 'bark' layers, and into the cambium layer. Remove the bark and as much of the cambium as possible. Dust the open area with a rooting hormone such as Hormonex® or Roottone®. Secure a piece of clear plastic wrap around the stem below the bottom of the cut. and create an envelope around it using the plastic wrap. Seal the top. In 3 to 8 weeks when the roots become visible through the moss, sever the cane just below the plastic. Remove the plastic, dust the cut with a rooting hormone and plant your newly rooted plant into a new pot using fresh soil. Water sparingly until new growth begins. Be careful not to over water the new plant or the old root system during the first few months. Shorten the stem that remains in the original pot to a height at which you want new branching to begin. It is possible to just cut the top of the plant off at the desired height, dust both sides of the cut with rooting hormone, and simply replant it into new clean soil. The cutting will root and the parent plant will branch at that point. This method is a slower and slightly more risky method, but is usually quite successful. You can also cut discarded portions of the stem into segments containing 3-4 rings. Create a mini-greenhouse with a frame of cut wire coat hangers and clear plastic over the pot to increase humidity and avoid the soil from drying out.